Gianni Infantino will succeed Sepp Blatter as the new president of FIFA after winning an election that went to two rounds on Friday in Zurich. The 45-year-old UEFA general secretary, a lawyer and sports administrator who joined European football's governing body in 2000 and rose through the ranks, became FIFA's first new president in 18 years. Blatter, who is serving a six-year ban from football, announced his resignation in June after a corruption scandal that engulfed the organisation in May. Infantino was elected in the second round of voting with 115 of the 207 votes from FIFA's national associations, defeating Sheikh Salman Bin Ebrahim Al Khalifa, who had 88. Prince Ali Bin Al Hussein of Jordan retained four votes, and former FIFA executive Jerome Champagne of France had none once voting went to a second ballot after no candidate earned the required two-thirds majority of votes in the initial voting process. 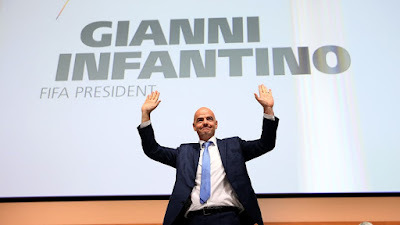 "Dear friends, I cannot express my feelings in this moment," Infantino said in his acceptance speech. "I told you I went through a journey, an exceptional journey, a journey which made me meet many fantastic people -- many people who love football, who live football, who breathe football every day, and many people who deserve that FIFA is highly respected. "And we will restore the image of FIFA and the respect of FIFA, and everyone in the world will applaud us and will applaud all of you for what we'll do in FIFA in the future. We have to be proud of FIFA, and everyone has to be proud of FIFA and we have to be proud of what we'll do together in FIFA."